Why would you pay more or try to sell your house yourself? For Sellers, Discount Realty Florida, LLC provides full service representation at a discounted commission rate. When the listing broker is DRF, the Seller pays a total of 4% commission instead of the typical 6% most brokerages charge. 1% is paid to DRF for listing the property and 3% is paid to the Buyer’s agent at closing. If DRF finds an unrepresented buyer for the listing, which happens frequently, the total commission paid to DRF at closing is only 3%. That’s half what most charge! The home will be listed on the MLS (Multiple Listing Service) and approximately 50 other web sites. Highest quality promo photos taken by a professional photographer at no cost to the owner. Expert consultation on negotiating the purchase contract and processing the other docs needed. Coordination of all showings of the property by our local broker. Electronic document processing with esign. An initial broker’s opinion of value so we get the right price on your home. Home staging and repair recommendations for achieving the best and fastest results. A Supra electronic lockbox placed on the property and a DRF sign in the front yard. 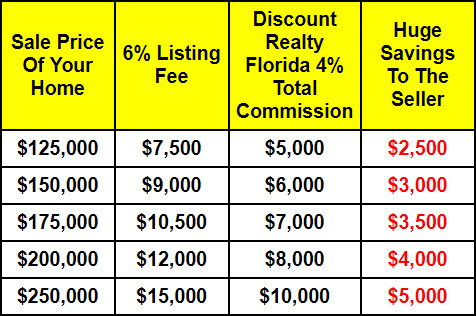 *There is a minimum commission listing fee of $1,175 that Discount Realty Florida charges on all listings.